For an overview and quick start guide to Fakes, see Isolating Code Under Test with Microsoft Fakes. Because stubs rely on your being able to structure your code in this way, you typically use stubs to isolate one part of your application from another. To isolate it from other assemblies that are not under your control, such as System.dll, you would normally use shims. See Using shims to isolate your application from other assemblies for unit testing. To use stubs, your application has to be designed so that the different components are not dependent on each other, but only dependent on interface definitions. Instead of being coupled at compile time, components are connected at run time. This pattern helps to make software that is robust and easy to update, because changes tend not to propagate across component boundaries. We recommend following it even if you don’t use stubs. If you are writing new code, it’s easy to follow the dependency injection pattern. If you are writing tests for existing software, you might have to refactor it. If that would be impractical, you could consider using shims instead. As it stands, this method might not compile or might throw an exception because work on the StockFeed class is not yet complete. Interface injection addresses both of these problems. The code of any component of your application should never explicitly refer to a class in another component, either in a declaration or in a new statement. Instead, variables and parameters should be declared with interfaces. Component instances should be created only by the component’s container. By "component" in this case we mean a class, or a group of classes that you develop and update together. Typically, a component is the code in one Visual Studio project. It’s less important to decouple classes within one component, because they are updated at the same time. You’ve decoupled the class you want to test from the other components that it uses. 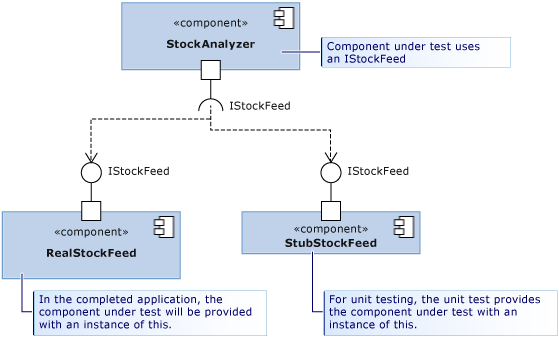 As well as making the application more robust and flexible, the decoupling allows you to connect the component under test to stub implementations of the interfaces for test purposes. Method signatures with pointers aren’t supported.